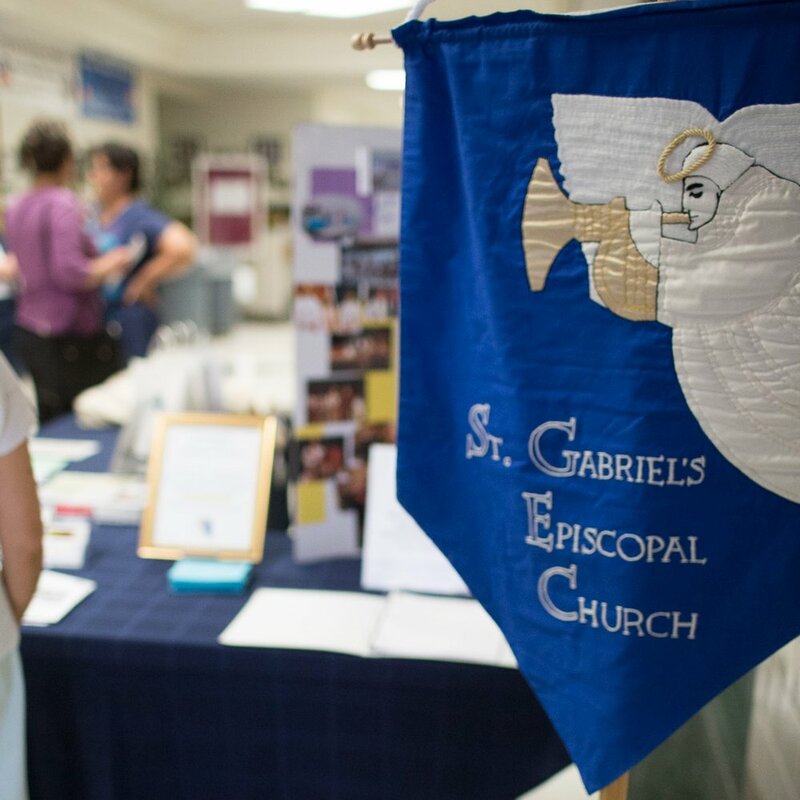 St. Gabriel's is a bilingual church plant in the fastest-growing county in Virginia. It worships in English on Sunday mornings at a local middle school, and in Spanish in the afternoon in borrowed space at another Episcopal parish. The parish is located in the fastest-growing county in Virginia, in the exurbs of Washington, D.C. The area population is somewhat younger than the state average, and it is 62% white, 10% Latino, 9% African-American, and 16% Asian. Per capita income in 2016 is estimated at $52,538, well above the national average of $33,205. Educational attainment in this area is higher than the state average. St. Gabriel's is a fifteen year-old church plant. When the founding vicar left, the diocese delayed calling a new priest for about four years, and membership, which had been nearly 200, dropped to 120. The next vicar had a brief tenure, during which membership and attendance dropped still further. The current vicar arrived to find 20 people worshiping at St. Gabriel's, and he has steadily built attendance and membership. The congregation is being given land on which to build (the transfer is in process), and they have established an outdoor chapel and stations of the cross. On the Sunday of the site visit, both the morning and afternoon congregations appeared to be comprised of a broad spectrum of ages, with many young persons present. The English-language service had a diverse congregation, while the congregation at the Spanish-language service was overwhelmingly Latino. Many of the Latino parishioners are Salvadoran, though there are also members from Bolivia, Peru, Mexico, Honduras, Cuba, Guatemala, Columbia, and Puerto Rico. Many live in apartment complexes near the center of town, and because Virginia does not issue driver's licenses to undocumented persons, St. Gabriel's morning worship in a suburban middle school is not very accessible. As a result, the decision was made to locate the afternoon service at the big Episcopal church in the center of town, in easy biking and walking distance of those apartment complexes. The vicar describes many of these parishioners as "underchurched," being hungry for more Christian formation offerings, and so he has started a Bible study after the liturgy. Well before the service begins, a member of the congregation pulls up, towing a trailer with St. Gabriel's name and logo. Several parishioners unload rolling crates from the back of the trailer, as well as portable altar rails, folding tables, and other equipment. Within a half hour, they have set up for the service. A table is positioned in the school lobby, with pamphlets, a foamcore display, name tags, and bags loaded with things to keep small children engaged. A folding table is placed on blocks on the auditorium stage and covered, to serve as an altar. Hangings and a cross are set out, along with battery-powered "candles" (to comply with the fire marshal). The presider vests in a beautiful chasuble made by a member of the congregation. The presider and lay leaders greet people as they arrive. The congregation spans the age range, from small children to the elderly. The worship bulletin includes all of the texts needed for worship, including the words (but not the music) for the hymns. Much of the music is "praise songs" or contemporary Roman Catholic music, drawn from Maranatha! Music, GIA, and other sources. There is much chatter before the service; the start of the opening hymn breaks through the chatter, and the procession moves toward the altar. The service follows the 1979 prayer book's Rite 2 eucharist. A "hymn of praise" by Marty Haugen is substituted for the Gloria in excelsis. The congregation joins in reciting the collect of the day--not exactly the way a collect has historically functioned (as a presider's prayer that terminates a period of silent prayer by the congregation), but something that one does encounter in some places. A "children's message" follows the collect. It is clear that this is a congregation that cares deeply about children: in addition to the "children's message," there are activity bags with religiously themed books and soft toys to help keep children engaged, and there are kids of all ages present in numbers. After the children's message, the readings and sermon follow. The prayers of the people are an adaptation of Form 6 from the 1979 prayer book, but omitting the built-in confession of sin and instead using the typical confession from Rite 2. The presider makes some interpolations into the liturgy, mostly for the sake of explaining the liturgical action or to welcome and include newcomers. Many parishioners are former Roman Catholics, so the presider adds a long invitation before the confession of sin. He invites worshipers to use the silence to "talk to God" and disclose any sins, and he states that he will then offer absolution "in the name of God." The presider later explains that this is so that they understand that they do not need private confession in order to receive communion, and that absolution is not a transaction between the priest and the penitent, which many find off-putting. He follows the same procedure in the Spanish-language service: before he began doing so, in a congregation of 30 only six would receive communion. The Peace is long and joyful. The eucharistic prayer is Prayer B from rite 2. The traditional form of the Lord's prayer is used. After the invitation to communion, the vested ministers leave the altar on the auditorium stage and distribute the bread and wine at portable rails that were set up on the floor in front of the stage. The postcommunion prayer is drawn from Enriching Our Worship vol. 1. The service concludes with a blessing, final hymn, and dismissal. On the week of the site visit, a potluck lunch and annual meeting followed the liturgy. This liturgy takes place in a large, Episcopal parish near the center of town. Before the service, the vicar and a seminarian assistant set up for worship, placing a large (near life-size) statue of the Virgen de Guadalupe next to the lectern, with several candles before it. This has the effect of transforming the space, which featured several Anglo trappings, including a Union Jack flag. A table with Spanish-language pamphlets, visitor cards, and similar items is placed near the main door. The service booklet provides the full text of the liturgy, including all of the words (but not the music) for the hymnody. People begin arriving before the service, but they continue to arrive during the course of the service. There are folks of all ages, including many children. The liturgy is entirely in Spanish, except for a few phrases and sentences in the children's message. The vicar explained beforehand that the children are typically bilingual, even if some of the parents are not. The sprinkling of English in the children's message, therefore, is a mark of the vicar's careful attention to culture-- he calibrates his method to suit each audience. Indeed, everything about the service demonstrates the vicar's knowledge and experience as a bilingual priest himself: the location within walking distance of most of the target population, the use of language, the care taken in selecting hymnody, etc. At this liturgy, the presider makes the same interpolation to the invitation to the confession of sin that he did in the morning liturgy. Additionally, he expands on the invitation to communion, to emphasize that all are welcome. Later, he explains that many who attend the afternoon liturgy had been refused baptism: the practice in the local archdiocese is to withhold baptism from children whose parents are divorced, single, or cohabiting. Several who first received communion later were baptized. The liturgy unfolds according to the authorized translation of the 1979 prayer book and to a translation of Enriching Our Worship (for the postcommunion prayer). Hymns are drawn from a variety of sources, and the music is sung with enthusiasm. The Peace is long as people circulate and greet one another. The Lord's prayer is sung, to the tune of Simon and Garfunkel's "Sounds of Silence." At this service, a young man in the parish makes his formal "first communion," and several adjustments are made in the liturgy to celebrate this. The paschal candle is placed near the pulpit, recalling baptism. The sermon teaches about the sacraments. The boy and his family receive communion first, before the rest of the congregation. While the Episcopal Church teaches that all baptized persons are encouraged to receive communion from the moment of their baptism, this is an example of liturgical inculturation, adjusting the liturgy to take account of the importance of a formal First Communion in much of Latino culture. The presider's warm tone and obvious affection for his people comes through every part of the liturgical action. Everyone lingers after the service, some making devotions before the Virgen. A festive meal follows in the parish hall, celebrating the young man's first communion. The liturgy in both services is done with warmth and authenticity. There is a bit of informality around the edges, noticeable especially in the morning service, and likely the result of the setting and the size of the crowd—it is hard to be stiff with a congregation of fifty in an improvised sanctuary. Nevertheless, this is clearly structured worship done with care. The personality of the vicar as presider invites and draws people in, and the congregants themselves are friendly and welcoming, without overwhelming the visitor. Completing the land acquisition and constructing a building are part of the long-term goals of St. Gabriel's, and an outside observer can't help but wonder how that kind of permanence may subtly change the feel of worship. Worship is planned by the vicar and a part-time church musician (a geologist with the US Geological Survey). They draw on the 1979 Book of Common Prayer and a variety of music resources, including the Hymnal 1982, Gather, and Wonder Love and Praise, as well as Flor y Canto. St. Gabriel's faces numerous challenges. Some are familiar to church plants: the use of borrowed space, the complications of acquiring land and eventually building, the need to market the church, and so forth. In addition, there are challenges particular to Latino ministry: marketing the church in an area without a local, Spanish language media outlet; fundraising; providing Christian formation to an underchurched population; addressing the needs of undocumented persons; serving a congregation that Anglo outsiders see as monolithic but that actually is made of persons from a wide array of distinct cultures, far more a mosaic than a monolith. The vicar and lay leadership faces both of these sets of challenges, while serving two distinct congregations at two different locations, and doing so with limited financial support. St. Gabriel's success is all the more remarkable as a result. 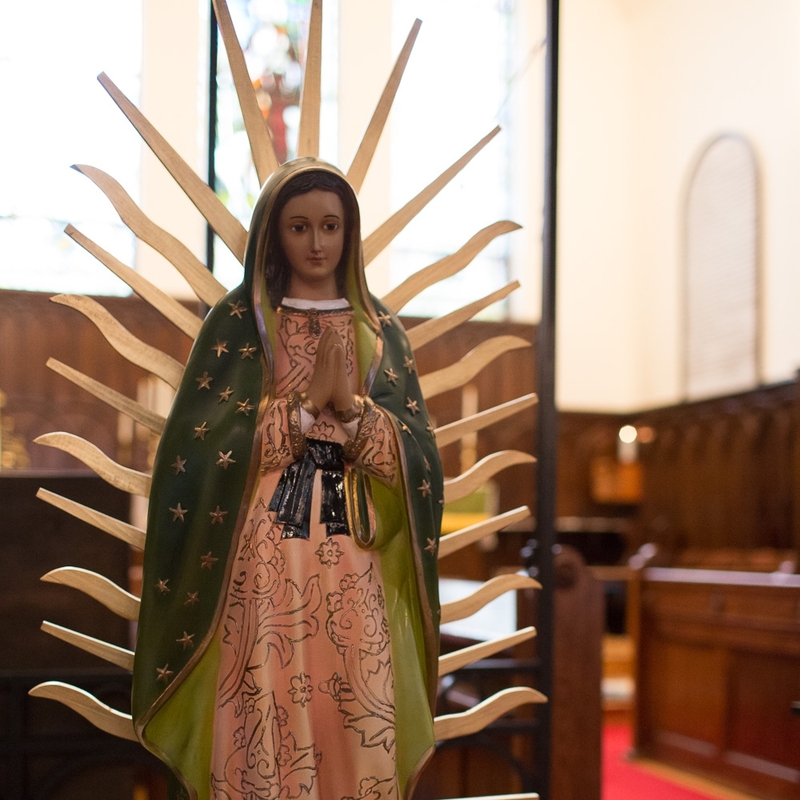 As an example of the mosaic of cultures in the Latino congregation, the vicar describes his experience putting together a celebration for the Feast of Our Lady of Guadalupe. [For a video of the celebration, see the parish's YouTube video below.] This feast is part of Mexican culture but is not universal in Latin America—other nations observe different Marian feasts—and so he had to consult with fellow missioners in Latino ministry around the church and with some of his parishioners to determine what the essentials would be (for example, singing "La Guadalupana"—as the vicar put it, "if you don't sing that, you have't had Guadalupe"— and singing "Las Mañanitas." While meeting in a Mexican restaurant with a lay leader to plan the liturgy, they happened upon a mariachi band and recruited them to play. Because there is no local, Spanish-language media in Leesburg, they advertised with fliers and by word of mouth. Afterwards, one parishioner praised it as being "just like home." The vicar's cultural skills, improvisational abilities, ability to recruit and empower others, and can-do attitude made it a success.